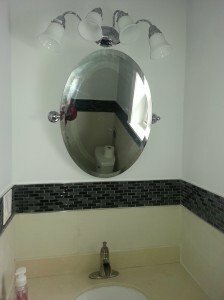 The pictures show a bathroom remodel done by Lauterborn Electric. The bathroom was wired to the newest electrical codes and a dedicated 20 amp circuit was run for a GFCI outlet. Lighting was installed with a customer provided layout. 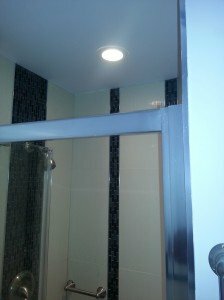 A shower rated recessed fixture was installed over the middle of the shower, a vanity light supplied by the customer was installed over their new vanity and a ceiling fixture was installed for general lighting in the bathroom. 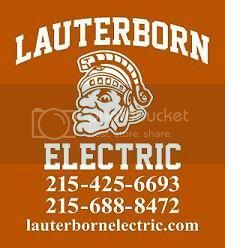 For all your electrical needs contact your Philadelphia licensed electrician Lauterborn Electric. Click Images to Enlarge.